A new way to really get rid of your depression for good has been discovered. Thousands of people have learned how to do this and you can too. Watch this video to learn how it works! If you don’t have this new app yet you can get the app in the app store for your phone or tablet or you can use the computer based version that’s right on this web page. This unique app is designed to allow you to guide yourself through a series of audio instructions for doing the Pure Awareness Techniques. The Pure Awareness Techniques are a new technology for powerfully and permanently resolving depression and other emotional problems. Each technique has it’s own series of audio instructions. In order to have the audio instructions play smoothly without interruption the software is set to download the full sequence of audio clips when you click on the DOWNLOAD button. The process of downloading the audio instructions for each technique will take from a few seconds to a minute or two depending on the speed of your internet connection. However, you only have to do this once as the audio clips are then held in the cache of your computer, smart phone or tablet. It is highly recommended that you download all of the audio clips for the techniques listed at the beginning of the application for each topic. When all of the audio clips have been successfully downloaded to your computer and/or mobile device the techniques are “activated” and ready to play. The downloaded files are shared by most of the applications so if you use the techniques elsewhere on the site, once they are activated here they will also be activated anywhere else that you use them. This is different on a phone or tablet. Phones and tablets typically don’t allow the sharing of audio files between apps so if you get more than one Inner Guidance app for your mobile device you’ll have to download the audio instructions for each app that you get and keep on your phone or tablet. Choose if you want the instructions in a female or male voice and then click on the links below to access the page for each technique. Then click the START button to activate it and download the audio clip sequence for that technique. Do that for each of the techniques you will be using and then you’ll be prepared to get started. Once the downloading process is complete you can start to use the techniques. To use the techniques you have to first be able to feel the sensation of the energy of the emotion that needs to be resolved. The instructions on the web page for each application explains how to do that. Once you can feel the energy field of the emotion you start guiding yourself through the appropriate technique by clicking or tapping on the button labeled “START,” The button will then change to the word NEXT and you advance through the audio instructions by clicking on the NEXT button for each new instruction. Each time you click the NEXT button you get the next audio instruction for that technique. This allows you to hear the next instruction in your own timing. You take whatever time you need to follow each instruction and have the resulting experience. Then when you are ready for it you click for the next instruction. You are about to learn how to resolve your depression. This is going to take learning to do some things that are the exact opposite of what you have been doing your whole life. You’ve been suppressing the pain that’s at the basis of your depressed feelings and you’ve also developed a habit of wishing that things had been different, wishing things had turned out the way that you had expected them to. These patterns of conditioning keep you locked into having depressed feelings and not knowing how to come out of them. Everyone develops 2 databases of disruptive “not-useful” emotions. Here’s the chart of the types of emotions that everyone has. Although depression is listed as a reactive emotion on the right side of the chart, there is often a painful/Internal component to it as well. With the Vaporize your Depression app you are going to learn how to resolve both kinds of energy… completely. The key to being able to breakthrough and finally get rid of your depression is to approach it on a new level… on the level where it really lives. The content is the part that most people and most approaches focus on. But it is the energy of the emotion that gives it life. When the energy is gone, the emotion is gone. The circumstances may still be there but the “charge” of your emotional reaction to the circumstances will be gone. It becomes neutral. What you’ve done in the past hasn’t been working so we need to approach it in a new much more highly effective way. You already know about things that don’t work. You need something new. And fortunately you have found it! What we know is that chemical approaches, drugs, herbs, etc. don’t work or if they do help it is only temporary symptom relief. You have to keep taking them and the drugs typically have negative side effects. When you stop taking the drugs or herbs you still haven’t really dealt with the disruptive emotional aspect of the problem that is its true basis. So typically the depression comes back. Traditional therapy approaches the problem through the mind. We all know people who’ve gone to traditional therapy for years and still have their problems. There’s something missing with this approach. What’s missing is that at its real essence, depression is the experience of a pattern of energy. Intellectually understanding why you have it or where it is coming from doesn’t get rid of the energy. That’s like understanding everything you can about a virus that is on your computer, what it is called, where it came from, how it is corrupting your files, etc. That doesn’t get rid of the virus. You have to run the appropriate anti-virus software to get rid of the “energy pattern” (in this case the pattern of on-off electronic impulses that is the code of the virus) in order to get rid of the virus and it’s harmful influences. Traditional cognitive therapy doesn’t do that. But that’s exactly what this Vaporize your Depression app is going to show you how to do! So the new approach that you are going to learn from this app is how to effectively resolve the disruptive emotional energy that IS what the depression is made of. It is literally like running anti-virus software on yourself! It is going to wipe it off of your hard drive!!! I know that it sounds too good to be true… but it is true. You don’t have to take my word for it. Just use the app, follow the instructions and see for yourself! 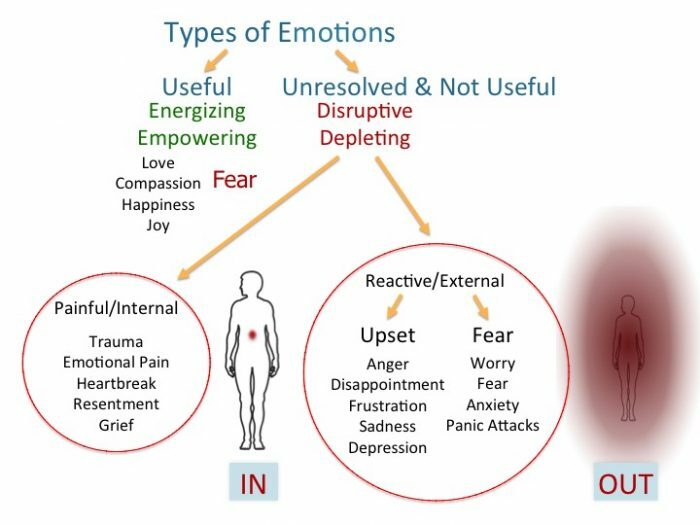 People who have depression usually have both of the kinds of disruptive emotional energy patterns shown on the Types of Emotions chart above. So the app is going to show you how to resolve both kinds of energy patterns that contribute to your depression. You’re going to learn how to allow yourself to feel the energy of your old unresolved emotional pain that is at the real root of your depression. And once you learn how to locate the emotional energy and feel it, you’ll learn how to put your attention right into the center of the most intense part of the energy field of the old emotional pain and how to completely resolve it. And you are going to learn how to extract yourself from the energy clouds of reactive emotions. You’ll learn that you are holding onto a story in your mind about what you wished would have happened. You wish that your expectation of how things would be would have turned out the way you wanted instead of the way that it did. Even though life showed up the way that it did and not the way you wanted it to be, you are still stuck in your story and the sadness about it not happening how you wanted it to be. Again, intellectually understanding has not solved the problem and it can’t. Even understanding that you are continuing to make up this story in your mind doesn’t stop you from doing that. You haven’t been able to let go of that story. You need another anti-virus program for human beings for this one too. What you need is called the OUT Technique. It will show you just how to extract yourself from the energy field that is locking you into your story and making it nearly impossible to let it go. This app is going to show you how to break out of the jail cell of this story’s energy field. Once you are outside of the energy field, you will see… it’s like magic. It will allow you to finally be able to be at peace with what happened and stop wishing that it was different. Sounds amazing but… it works! You have to experience it to believe it. The problem is that this is a deeply conditioned “bad habit”. Just deciding that you won’t do that any more isn’t going to work. The conditioning will keep you locked into doing this unless we do something to really break the conditioned pattern. That means we attempt to provoke the depression by thinking about what happened or didn’t happen in the past that is the topic of the source of your sadness and depression. We’ll see if you feel differently about it now. The most common report from people when they do this is… It’s completely gone. It’s become a non-issue. It’s just something that didn’t happen the way that I wanted but it doesn’t make me feel sad or depressed any more. Wow! Then whenever you are ready, if you have another depressed feeling that you want to get rid of, start the app again and guide yourself through the process again. Sometimes people have multiple issues or multiple versions of the energy patterns that are holding their depression in place, If you do, the provocation test can be done for the specific situation that you first worked on. If it isn’t fully resolved yet, no problem. It just means you need to use either the IN or OUT Technique or both of them a little more. It’s like you just need to run the anti-virus software a little longer to finish the job. You’ll know when it’s gone because it feels totally different. And if when you do the provocation test you can really feel that the original issue is resolved and there’s no more depression energy, even though you can certainly remember the events, that won’t matter because the “charge” that’s been holding the discomfort of your depression in place will be completely resolved. You’ll be free of the depression… for good. So then you can do a variation on the provocation test and also use the LOCATE Technique (which is a part of this app) to locate any additional energy patterns that could be contributing to any other feelings of depression. Then you will shift to the IN and/or OUT Technique and resolve the true basis of any aspect of your depression that needs resolution. You can resolve as many of your depression energies as you feel comfortable to do in one sitting. That’s entirely up to you. If you have any trouble with doing the IN or OUT Techniques on your own using the app, you can get 1-on-1 personalized coaching by booking a session with one of our Certified Inner Greatness Coaches. You can get this kind of expert personal support by using the on-line booking system form at the bottom of this page. Because of your life-time of suppressing your emotions the traumatic emotional energy that is at the basis of your depression may be a bit hidden. After all, you swept it under the rug in an attempt to do the best that you could to not have to feel it. In order to resolve the depression you are going to complete the incomplete experience of the stress of the sadness that is at the root of your depression. That means we have to do something that helps you to now get access to it and allow you to feel it. There are two possible ways to make that happen that are explained below. If you haven’t yet activated the techniques by downloading the audio clips, do that now. Select if you want the instructions in a female or male voice and then click the appropriate link below. You will immediately get a new screen with two large buttons on it. The one on the top says – START. The one below it says REPLAY. When you click on the START button the audio clips will download. You’ll see a progress circle showing you what % has been downloaded. Once you have activated each of the techniques you are going to be using to vaporize your depression, you can start. The first time to you play the instructions the button will say PLAY or START and when you click it, it will change to the word NEXT and you will hear the first audio instruction that will tell you to close your eyes. The techniques are easiest to do with your eyes closed. The buttons are big enough that you can just keep your thumb (for smart phones) or the mouse cursor right over the button and keep clicking on it for the next instruction even with your eyes closed. To feel the energy of the sadness stress still held in your body, simply think about something you are depressed about. When you do, you may be able to feel the underlying trauma that is the cause of the depression. Then again, you may not feel it because it’s so well suppressed. If you can’t feel it by thinking about it, you can use the LOCATE Technique that is explained below. If you can feel it and the sensation will feel like a tight knot or ball of energy. That’s the IN Technique energy part of the depression. If you can feel something that seems localized, concentrated, constricted… then start the IN Technique app and guide yourself through the resolution of this old traumatic stress. If you don’t feel the energy of the sadness stress when you think about it, then you can use the LOCATE Technique to help you get access to it. Start the LOCATE Technique that is the process for preparing to do the IN Technique. The LOCATE Technique for the IN Technique will guide you in finding where the IN Technique energy is being held in your body. As soon as you feel the IN Technique energy field, shift to the IN Technique app and guide yourself through the resolution of the old traumatic pain. Here are the appropriate links to the apps just mentioned. Depression can have both IN and OUT Technique energies. Once you have resolved the IN Technique energy by either of the above methods, now we want to resolve the reactive emotional energy part of this feeling of depression. You can start by thinking of something that makes you feel depressed. You may be able to feel a kind of cloud or aura of energy that radiates out from your body into the space around you, like shown in the Types of Emotions Chart above. If so, start the OUT Technique app and resolve it by simply following the audio instructions in the app. Either when you use the LOCATE Technique or if you access the cloud of reactive emotional energy by just thinking about something that normally makes you feel depressed, as soon as you get access to the OUT Technique energy field shift to the OUT Technique app and resolve it. Use the appropriate technique via the links just above. When you have finished resolving one of your feelings of depression… open your eyes. You just vaporized the stresses that have been causing one of the areas of depression in your life. If for any reason the depression didn’t go away, you can also get another form of personalized help from a Certified Inner Greatness Coach by booking a 1-on-1 session. Use the Appointment scheduling form at the bottom of this page. 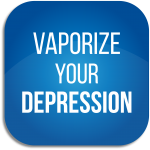 If you are having success with getting rid of your depression using the Vaporize Your Depression app then you can continue to use it until all of your depression is really gone. In order to do that you may need to use the LOCATE Technique repeatedly until you can’t find any more traumatic or depression energy patterns. When you reach that point you’ll really be starting to live a depression free life. And if you ever feel depressed again in the future you’ll know exactly what to do and you can always use the app. One other point, after you have used the LOCATE Technique the first time or the first few times (you decide) you’ll be getting the feel for how to do it. We have a short version of the LOCATE Technique that you can use once that is the case. Here are the links for doing the short version of LOCATE that you can try out when you feel you are ready for that. We look forward to helping you to become depression free. If for any reason you have any difficult with doing any of the techniques on your own via the app, don’t worry. This is quite common. Remember that you have a lifetime of doing the exact opposite of what’s needed. So if you have any problem with it there’s no need to give up or think you can’t do it. What you probably need is just a little help from someone who is really familiar with doing this and with guiding others through the process. We can only do so much with a recorded app, even as good as the Inner Guidance App system is. If you’d like some additional support, you can get personalized help from a Certified Inner Greatness Coach by booking a 1-on-1 coaching session using the on-line booking system at the bottom of this page. If you aren’t sure whether you would benefit or not from some 1-on-1 coaching you might like to read this article about some of the reasons and details of why and how our Certified Inner Greatness Coaches can help you get the breakthroughs you really need – Getting the Breakthroughs You Need! Making Sure You Got It All! In order to do make sure that you are really free of any remaining energy that was at the basis of making that poor decision and to make sure that it’s really fully gone so that you don’t do that again, use the LOCATE Technique repeatedly and tell the body to show you any other remaining energy that you might still be holding onto that could possibly contribute to making poor decisions. When you tell the body to show you any such energy and then you tell it a second time and get no response from the body both times, you can be pretty sure that you got it all. You can also use our other free apps and recommend them to friends and family. Please spread the word via your social media, email lists, any support groups or forums for people who are struggling with depression or any of the topics below. Let them know about these great free resources and help us to fulfill our mission of removing the pain of the world.